Oct. 13 marked the 243rd birthday of the United States Navy. The Navy has grown and evolved dramatically from that first “swift sailing vessel” of the Constitutional Navy. Today, the Navy’s fleet of 286 ships and submarines is the most capable and powerful naval force in the world. The identity and traditions of the Navy were forged in numerous battles and military campaigns over the past two centuries. From its modest beginnings with a handful of ships tasked with protecting the maritime trade of our fledgling nation, the Navy first came of age with a string of decisive victories against the British Navy during the War of 1812—at that time, the largest and most powerful navy in the world. The fighting spirit of this underdog and upstart navy was captured by the dying words of Capt. James Lawrence: “Don’t give up the ship.” Oliver Hazard Perry made those words immortal when he emblazoned them on his battle flag as he commanded U.S. naval forces in the War of 1812, leading them to victory over the British at the Battle of Lake Erie. Another legendary moment in naval history came in the Civil War, when Rear Adm. David Farragut led Union sailors to victory over Confederate forces in the Battle of Mobile Bay. The image of Farragut lashed to the rigging of his flagship USS Hartford, ordering his ships to “Damn the torpedoes, full speed ahead,” has been ingrained in generations of young sailors up to the present day. The Pacific Theater during World War II saw numerous key naval battles and victories—and countless naval heroes. From the surprise attack of Pearl Harbor to decisive U.S. victories in the battles of Coral Sea and Midway, which began to turn the tide against the Japanese navy, and finally the battles of Philippine Sea and Leyte Gulf, which all but decimated Japanese naval forces and spelled the inevitable defeat of the Japanese, U.S. sailors distinguished themselves in history. In all, 57 Navy sailors during World War II were awarded the Congressional Medal of Honor. By the end of World War II, the U.S. Navy had been firmly established as the pre-eminent navy in the world, a place it held throughout the Cold War up to the present day. While the Cold War did not involve naval battles of the same scale and ferocity as World War II, the Navy continued to serve as America’s primary force for deterring and defeating adversaries for the remainder of the 20th century. Most of its victories during this period came during wars in places like Korea, Vietnam, Iraq, and Afghanistan, but the Navy also conducted countless other critical operations during the Cold War that ensured the safety and security of the homeland and our allies, without ever firing a shot. The Navy has also witnessed a host of technological changes that have transformed naval warfare: for instance, the shift from wooden to steel ships; from sail to steam power, and then nuclear power; the rise and fall of the battleship; submarine warfare, aircraft carriers, and naval aviation; and precision guided missiles. Today, the Navy is being further transformed by new technologies such as high-energy lasers, cyberwarfare, and unmanned robotic ships, aircraft, and submarines. But ultimately, the Navy’s success was not owing to the ships or the technologies it employed. In many naval battles and wars throughout its 243-year history, the Navy was outnumbered and often faced superior ships. What has always set the U.S. Navy apart is its sailors. Their skill and devotion have made the United States the most formidable sea power in history. Some will only know the names of a few naval heroes, like Oliver Hazard Perry, David Farragut, or Adm. “Bull” Halsey, but these men are merely symbols of the leadership, determination, adaptability, and resilience of U.S. sailors dating back to 1775. 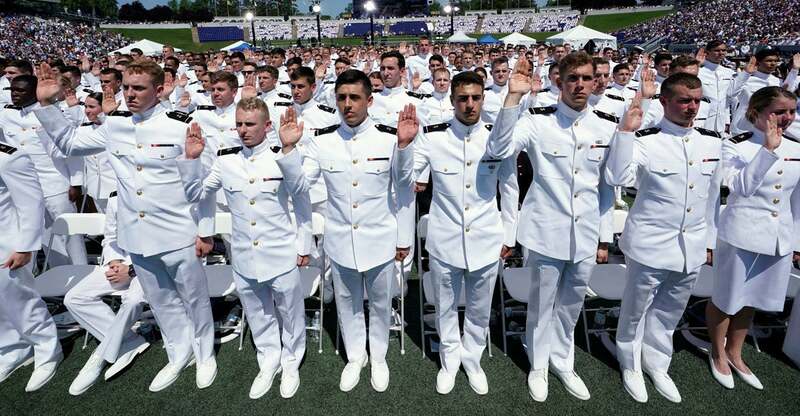 The more than 328,000 men and women who make up today’s Navy come from every state in the union and include a diverse cross-section of racial, cultural, and religious backgrounds. Their honor, courage, and commitment to the nation are seen daily in operations around the globe, ranging from humanitarian assistance and disaster relief to combat strike operations. The Navy does face significant challenges, however. China’s navy is a rising force with global maritime aspirations, and is rapidly improving in size, capabilities, and proficiency. Russia’s navy is resurgent, and while not the size of the former Soviet navy, it possesses a very capable submarine force. In addition, rogue regimes like Iran and North Korea continue to pose threats in their respective regions and beyond. Our Navy also faces its own challenges. Our fleet is still too small, and our ships are an average age of over 20 years. Moreover, U.S. budgetary constraints will only increase for the foreseeable future. But these challenges are not insurmountable. As our adversaries have learned the hard way for 243 years, they should never count out the U.S. Navy and its sailors. As long as Congress provides the Navy with sufficient and stable funding to rebuild and modernize the fleet, its sailors will continue to adapt and employ their ships, submarines, and aircraft with new tactics to overcome these new challenges—just as they have for 243 years.